I am always in a stage of recovery. These posts are especially devoted to my struggles with anorexia and body dysmorphia. A heaping spoonful every morning…except I don’t see too dramatic of a change. You wouldn’t think something as simple as fiber would fire me up, but it does. First off, my first doctor I admitted to struggling with my irritable bowel symptoms told me to eat more fiber. That was his only suggestion. I felt pretty distraught, feeling like I was wading through mud with no true answer in sight. Again, why so hung up on fiber? I didn’t want to be that stereotypical health nut that told the doctor I live a vegan lifestyle and that I somehow know more about medicine than he or she does. I just wanted to point out that on a daily basis, I eat a very healthy diet, one that already includes plenty of fiber for my daily needs. But obviously, my food consumption wasn’t helping much to ease my digestion. Here’s some more context on what my digestive health doctor told me to do, both tasks which made me quite nervous. I had to first take magnesium citrate, a laxative, to “clear out my system.” From then on, I would have a heaping spoonful of fiber supplement each morning to get myself back on a regular schedule. He never actually used the term “irritable bowel syndrome,” but instead described my digestion like a blocked dam that, when “about to burst,” would do just that. Since my doctor specializes in digestion and not mental health, he probably didn’t even consider my thoughts on laxatives. They aren’t fun no matter which way you slice it, but when in a constant state of anorexia recovery, I was especially hesitant. But I put my trust in the formula. 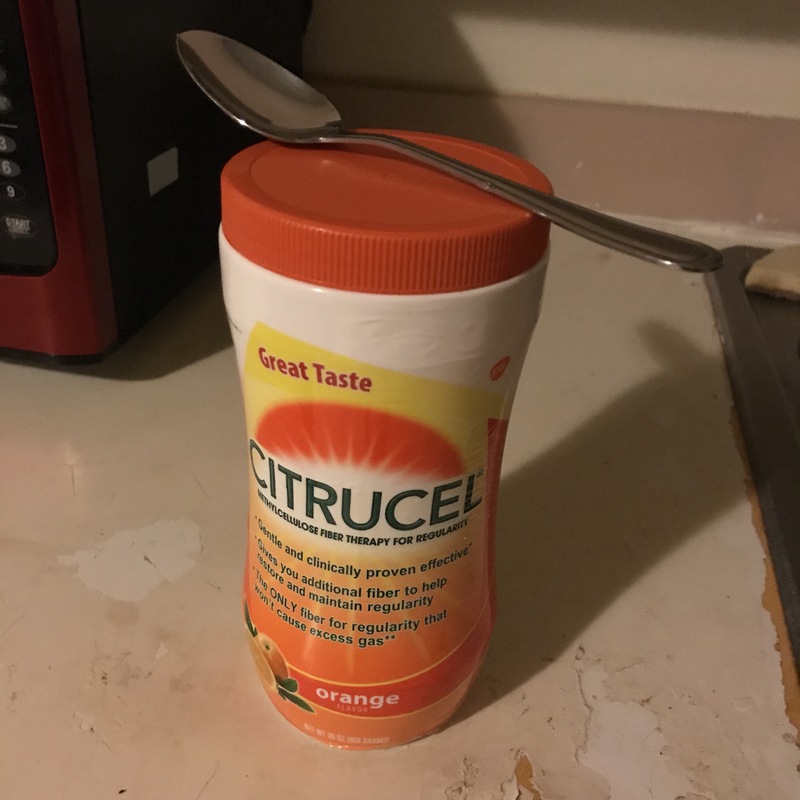 From that day (or night of sitting on the toilet) onward, I have had a spoonful of Citrucel in a cold glass of water every morning. I’m still giving it time since I’m not about to expect a sudden miracle or anything, but since it’s been a few weeks on this new routine, I can say it at least has made my schedule somewhat more predictable, although I still have many of my symptoms at play, especially the uncomfortable gas and bloating. Jumping back to my experience with anorexia. Taking each day at a time and still facing fears that leave me on edge, like eating a meal at a restaurant, mixing fiber in the process has felt more like a setback than anything. Whether I actually end up achieving it or not, I really want to become more intuitive and mindful with how I eat. My hunger cues at this point have relied heavily on the clock, as it seems most of my life does. There are certain times of the day that I generally eat, and that’s when I get hungry. It’d be nice to say my stomach is the one in charge, not my overthinking brain, I still say I’m just a creature of habit. I didn’t expect the fiber to change much of this situation, but it has admittedly thrown off my established norm. At least when first starting out, I don’t know if I actually felt hungry. It was such a weird sensation, knowing that you normally would be craving some food but instead are just…fine. It’s hard to describe, even in writing. My fiber supplement isn’t one of those appetite suppressants because that’s the last thing I need, but I still immediately felt those effects in the normal Citrucel formula. My gut was probably happy for something new, but my mind sure wasn’t. I felt like I was trying to manage one chronic illness while taking steps backwards in my mental health. Recovering from any eating disorder is long, hard process. For some, it doesn’t take but a few months to get back on track, but for others like me, it’s a lifelong battle. With my goal of some semblance of intuitive eating seemingly put on the back burner, I feared it was too big of a dream, too unrealistic for my body. The connection between the gut and mind is a powerful one. They often work in sync with one another, so when one’s off-kilter, so is the other. That’s been my biggest obstacle these past few months. Piling on IBS to my chronic mental illnesses toppled the process I’ve been making. The last few weeks have especially been brutal, feeling like I’m on the verge of a mental breakdown at any time. Luckily, however, I think my digestion is finally starting to readjust itself. The hunger cues are slowly coming back to me through still consistently eating when I usually do, acting like nothing is off. That would be my suggestion to anybody else who might be facing a situation where they feel discouraged and off: if you have an established routine already that works well for you, who says you have to completely disregard it? It takes time for our bodies to balance themselves out, and impatience only prolongs the process. With the close relationship between the body and mind, a positive mindset can work wonders for your health. Have you ever felt overwhelmed by one health treatment simultaneously working for you but throwing off your mojo? What did you do to overcome that obstacle? I’m sure plenty of people out there have walked in these shoes and would really benefit from others’ perspectives.